Scott Matthews bloomsbury theatre 10/06/09, with a face value price of £15, luckily I was able to pay £50 to ebay. Next up, Metric at the electric ballroom, again it was my pleasure to pay way over the odds and help kick start the ecomony over on ebay. Last.fm knows quite a few of the artists I like, and Windows Media Player knows all of them – why can’t they just email me when the tickets go on sale. Hmmm business idea perhaps? Who’s doing this? Surely someone in these heady days of Web 2.0.42.1, if not i’m building it this weekend. Why would Songkick want to hire me? Reduce number of HTTP request, by combining small images into a single sprite using the CSS sprite technique, This tool I’m told eases that pain: http://spritegen.website-performance.org/. Configure static assets to have an expiration date set far into the future. Host images off sub domains i.e. images1/2.songkick.com to increase parallel downloading. For example to comply with RFC 2068 Internet Explorer 5-7 limits 2 concurrent downloads per host. 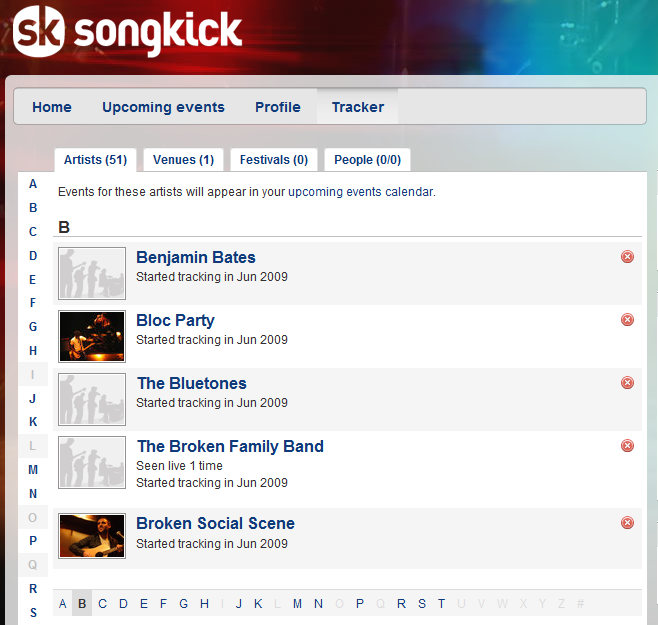 There are lots of 301’s being generated from beta-static.songkick.com redirecting to http://www.songkick.com, causing unnecessary HTTP chatter. I guess this is a temporary thing moving out of beta -but it’s not helping performance. In 1999 I started a web design consultancy with my brother Andy. To start with I did the programming, he did everything else. We sold the company in 2003 and I stayed on to help build the team from 5 to 10 whole people by 2007. Continuous integration, TTD, Scrum, lean, kanban and pair programming all sound pretty odd but are really rather useful. I enjoy practicing these techniques at least twice a day! I’ve been a .Net programmer on the server for quite sometime but more on the Alt.Net side than in the MSDN camp. I learnt Smalltalk at university, then Java, later moving to .Net. Recently I’ve been lapping up Objective-C and IPhone development, thanks to the good folks at Stanford. My rather rambling C.V. full of recruitment-agent-compatible (think grep) buzzwords can be found on my imaginatively titled about page. P.P.S My code is better than my prose.